The Marine Retailers Association of the Americas last night kicked off the Marine Dealer Conference and Expo in Orlando, with a gala dinner and awards ceremony. The event was a fast-moving mixture of awards presentations, comedy skits and moving speeches by some of the awards recipients. One of the primary goals of the event was to raise funds for the MRAA Educational Foundation. BRP said it would match any funds that were donated that night by the assembled group of dealers. Matt Gruhn, MRAA president and Liz Walz, MRAA Educational Foundation Executive Director, were joined by professional emcee, James Cunningham, who kept the evening moving with nonstop quips and a game-show spoof that featured dealers and other leaders of the boating industry answering trivia questions about the industry. 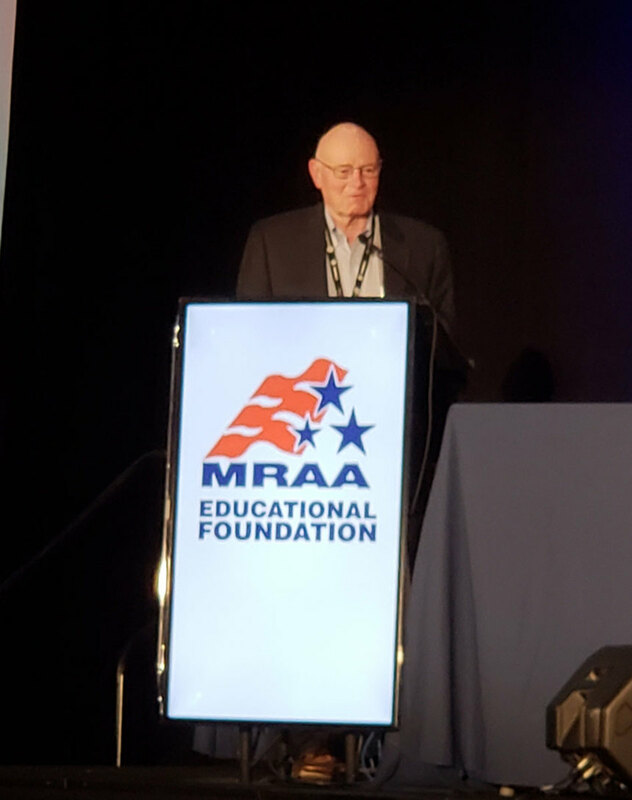 The MRAA Educational Foundation’s College Scholarship provides $5,000 for study at an accredited college to a student planning for a career in the marine industry. This year’s winner was Carter Goettling of Blue Springs Marine. Goettling began working at local dealership at the age of 15. In high school, he competed in the Skillsusa program in Marine Technology, winning a state competition and placing ninth at the national level. “The marine industry has been a part of most of my life so far, and I hope for it to be a large part of the rest of my life,” said Goettling, who wants to eventually become a master technician for BRP and Evinrude. The winner of the Duane Spader Leadership Development Scholarship was Chad Taylor of Taylor’s South Shore Marina. The winner of the Kevin Lodder Scholarship was Patrick Green, Director of Certification and Customer Service Manager at Tobler Marina of Hayden, Idaho. Pilkington thanked the MRAA, her family and colleagues at Correct Craft, who all sat at a table at the front of the ceremony. Pilkington credited Correct Craft’s founders, the Meloon family, for their support over the years and being like a “second family.” Pilkington has been active with volunteer work, both in the U.S. and abroad. She also serves as a mentor to female staff members of Correct Craft. The MRAA also presented 16 awards to “Great Dealerships to Work For,” which were nominated anonymously by dealer personnel, without the knowledge of the managers or owners. Those awards have grown from four last year to 20 this year.